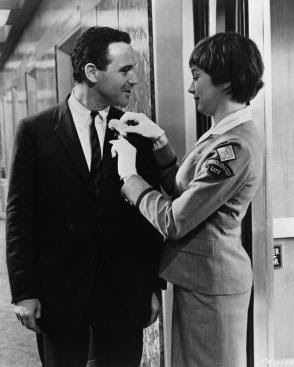 The Apartment; Billy Wilder’s 1960 romantic comedy, starring Jack Lemmon, Shirley MacLaine, and Fred MacMurray, takes on heavy subject matter with an “odd couple” sense of humor. C.C. 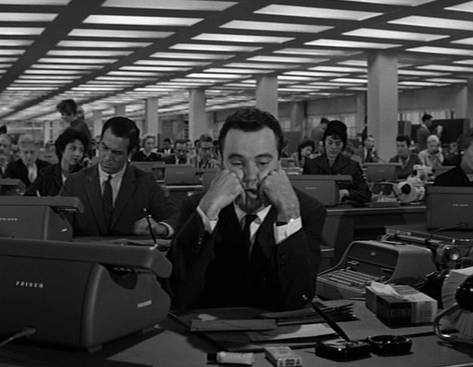 Baxter (Jack Lemmon) is just another insurance agent at Consolidated Life of New York. Or as Baxter describes it, “We’re one of the top five companies in the country. Our home office has 31,259 employees, which is more than the entire population of uhh… Natchez, Mississippi. I work on the 19th floor. Ordinary Policy Department, Premium Accounting Division, Section W, desk number 861.” In this narration we get a pretty good view of the kind of person Baxter is: dedicated to his work, lonely, and perhaps a little boring. Baxter tells us he has a nice apartment, perfect for a bachelor, if it weren’t for one problem: he can’t always get into it. See, Baxter is the kind of guy who takes crap from his superiors because he is afraid to take a stand for himself, and one day, one of his bosses asked him if he could borrow the key to Baxter’s apartment so he could change into his tux. Of course, not wanting to appear insubordinate, Baxter obliged. This act led to his boss asking for the room on certain nights to take his mistress there. Soon, word got around the office hierarchy and Baxter was booking his apartment at night to accommodate his promiscuous bosses. This presents a slew of problems for Baxter, as he must constantly replenish his room’s alcohol, ice, and crackers (oh, and LEAVE his house at night). One night, one of his “guests” stays beyond his checkout time and Baxter is forced to stand in the rain all night which leads to a rather intense cold. Each time something extreme happens, and Baxter’s patience wanes, he is about to blow his cap and tell his bosses that he just can’t do it anymore, and they say to him, “I’m going to send a great efficiency report to Mr. Sheldrake (Fred MacMurray) on your behalf. I wouldn’t be surprised if you get that promotion!” At this, Baxter shrivels back up into his ball and hands over his key. In many ways, this situation sums up the life of C.C. Baxter (if you couldn’t already tell). He is so easy to sympathize (and empathize) with. He’s the nice, genuine guy that never gets the girl. He even asks himself why women can’t fall in love with the good guy (a fair question, isn’t it?). It seems as though anything that can go wrong for him, does, and with an unfortunately high frequency. He is kind to Ms. Kubelik, even when she gives him the cold shoulder. He’s the kind of guy you just want to see good things happen to, and you feel it in the gut when they don’t. Wilder chose to film The Apartment in black and white, just as he did in Some Like It Hot the year before (another Jack Lemmon movie). The lack of color in this film certainly adds to the idea that Baxter’s existence lacks any kind of vitality. 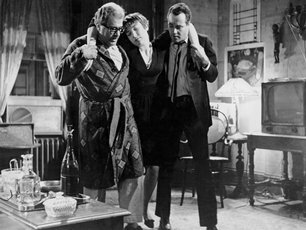 One of the nights that Sheldrake and Kubelik spend in Baxter’s apartment leads to an intense argument. Sheldrake leaves and Kubelik consumes half a bottle of sleeping pills (see what I mean? It gets pretty heavy). Baxter comes home to find her practically dead on his bed. 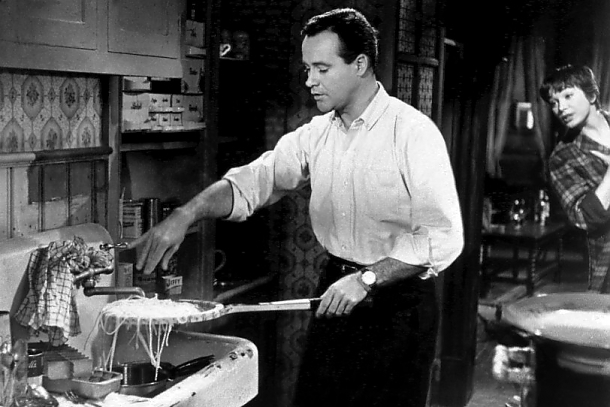 He runs over to his next-door-neighbor, Dr. Dreyfuss (Jack Kruschen), at 2 AM begging for his help to save Ms. Kubelik. There is an important side note of some comical significance to mention here. Dr. Dreyfuss has a somewhat flawed perception of Baxter. Every night he hears the giggles (and other sounds) of women in Baxter’s apartment and assumes (a safe assumption under normal circumstances) that Baxter is somewhat of a sexpot, different-woman-every-night sort of guy. Baxter allows this misconception because it makes him feel (if only for a moment) that he isn’t the outcast that he quite definitely is. On the other hand, as Ms. Kubelik finds out from Sheldrake’s secretary at the staff Christmas party, she is only one in a long line of mistresses (that includes the secretary herself at one point). She goes through all of the moves he traditionally pulls (all of which pull on Kubelik’s heart as she remembers him doing the same things with her). He’s just an all-around scumbag with a loving wife and children at home who he blows off to pursue his need for younger women and adventure. Anyway, Dr. Dreyfuss rushes over and assumes that Ms. Kubelik tried to kill herself because of something Baxter had done to her. This leads to a night full of scoldings, coffee, slaps and other antics as the doctor tries to revive Kubelik and discipline Baxter. Baxter takes Kubelik under his wing and over the next few days tries to nurture her back to health (because Mr. Sheldrake has more important things to do). 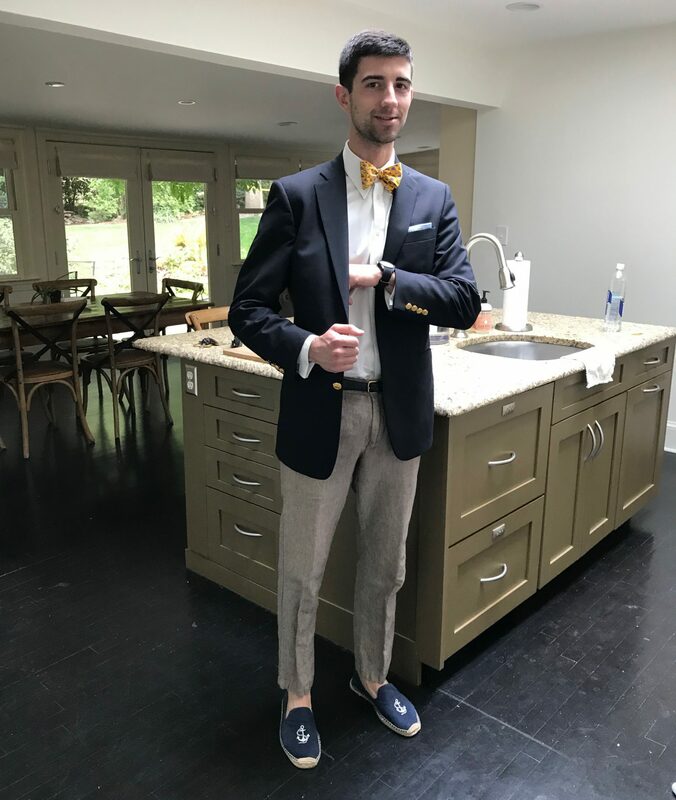 Once she is better, she goes back to Sheldrake, and just like that Baxter is back to having dinner with “Ed Sullivan and Mae West, who was much younger at the time” (generation gap again; he’s saying he watches TV when he eats). Baxter has the corner office (for his obedience to his superiors) and is left in a much less human state than when we first found him. Fear not though, as with just about every Billy Wilder film, in the end, the good guys get what they deserve (and so do the bad guys). And it all unwinds in typical Wilder fashion; just as we always hoped it would (just trust me; that’s what you were hoping for). In this scene, Ms. Kubelik has just found out about Sheldrake’s long list of affairs from his secretary. Baxter has just been promoted and teems with excitement, which he wishes to share with her. This is also when Baxter puts two and two together as he notices she has the same broken mirror he found in his apartment the first night Sheldrake took “a” woman up there (now he knows who Sheldrake has been taking up to HIS apartment). This is one of those scenes where you just feel really bad for the guy. If the video doesn’t load, click the “The Apartment – The Junior Executive Model” link in the video frame, and it will redirect you to YouTube. Sorry for the inconvenience! This movie is one that I have actually seen before. It must’ve been while I was flipping through channels and landed on TCM but somehow I watched a majority of it. Usually I cannot get into some of the plots of older films but I actually enjoyed most of this one. Anyway this is a great review of a solid movie. Well done and I look forward to future movie reviews.